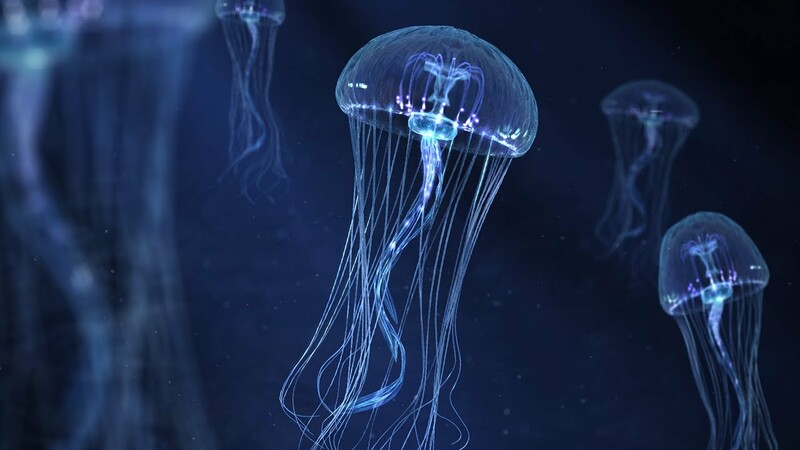 In this Tutorial, Patrick Goski and Nick Campbell answer a question from brett_morris during AskGSG about how to make a jelly fish scene similar to this great render by James Gardner-Pickett. Just watched the first 12 minutes and it already blew my mind. Did Patrick really made this techniques up on the go? Awesome! Yep. We don’t know what the questions are until we hit record on the Live Stream. Patrick is great, isn’t he? Sweet! Nice work guys. For floaties, you could add a gradient texture to the transparency of your discs so they are not sharp when in focus. Final render looks great. Thanks for another great GSG session! One of the best videos to date! Using the jellyfish_profile spline to model the jelly brain was great. I can’t wait to see the “Other Tutorial” that was in C4d when you switched windows. Would love to see this taken to the next level and animated! I wonder if we think about rigging the jellyfish it’s gonna be a lot of fun : ) correct ? Could you Please! Please! make a tutorial on this effect. Learned a lot from you! Thank you very much! Yea I would love to see a tutorial of this one! I already saw a tutorial of this one a long time ago but can’t find it anymore. I have met that effect before, the one with the faces is based on a lot of Python coding. But you can get something really close using X-particles. hey Nick! Amazing tutorial. I was wondering if you could share the HDR image you chose to light and reflect in the scene. I believe it was called “onthesideoftheroad” Thank you in advance. Great Tut. The setting to get the disc to face camera. Under transform – bank 90. WOAH hold up what tutorial is the project with the face you x out in the very beginning?!?! Great tutorial! Awesome as always! Wow, this is a great result! Do you own the hdri light tool made by Nick? Or did you make this without it? Awesome. Come on over to C4D. You will love it. As a Broadcast user I wish this was executed in one of the lesser versions of C4D. There are workarounds I am sure. That transparency always makes for a pretty render. I am trying to learn cinema4d better by doing the tutorials on the site. And i encountered a problem with this one. When i try to render it i get a error “not enought memory”. I have 8 gigs, isnt that enough for this scene? i have done similar scenes and they worked fine. Do you guys know some settings that can help me? I made an animation 14340 frames long, It saves only the last 30 frames… I N-E-E-D to find a way to fix it so it will save the entire animation… HELP ME PLEASE, GREYSCALEGORILLA!!! Awesome tutorial… by the way, can you show us how to animate it? where i can find the HDRI used in this tutorial? Can you please tell me where can i find that HDRI “on the side of the road”? Thanks for the great tutorial!! learned a lot from this tutorial. Thanks for an awesome tutorial! Once again I learned a ton! I was wondering how you fixed the issue with the spline wrap for the entire jelly fish? This is awesome! Do you have C4D and Zbrush workflow tuts? Hi, I completed this tutorial but I had one strange problem. In the work window and in the preview, the individual strands of hair wouldn’t render, only the roots. So it looked like everything was working fine! However when I actually placed it in picture viewer, it rendered with all the hairs. I have no idea why this is happening. I unchecked “render hair” yet in picture viewer it renders all the hair every time. Could someone help?